Pots of bulbs make great presents. Even if they are not flowering at Christmas, their new shoots will be bursting with energy, holding out the promise that spring is just around the corner. When they do flower they will be brightening the dark days at the beginning of the New Year. Bulbs. If the bulbs have been hanging around in your garage or in the garden centre for weeks (or longer) they may not be in the best of shapes. Choose bulbs that are still firm and that do not show signs of mould. Don’t worry if they are beginning to produce shoots: as soon as they are potted they will start to make roots and start to grow healthily. If I am giving them as presents I keep things simple and plant bulbs of only one variety in a pot, as separating different bulbs and remembering what’s what when you come to plant them out can be difficult. One of the bonuses of offering bulbs as a gift is that, planted out in the garden after flowering, they will flower the following year. Containers. When choosing a container for your bulbs to grow in, you should first think about what the bulbs need to produce flowers. Good drainage is essential for bulbs to thrive so the container needs holes at the bottom and a layer of a chunky material that allows water to drain away easily. Usually this is broken pieces of clay pots but bark chippings or pieces of torn polystyrene work just as well. Anything from traditional clay pots and wicker baskets to the more eccentric broken kettles or old wellingtons can be planted up. As long as a container has plenty of drainage holes it can be used to grow bulbs. I once saw a collection of sparkling tin cans overflowing with bright blue Scilla siberica. I thought the effect was attractive and amusing but several of my friends would be taken aback to receive a present planted in an old baked bean can. Clay pots are always beautiful and are easy to find. Even antique pots, such as the small Sankey pots, are inexpensive to buy. Wooden boxes or woven baskets (lined with polythene) also make attractive containers. If you are wanting to plant up several containers, as presents, visit a local or on-line florists’ suppliers where inexpensive ones can be found. Compost. 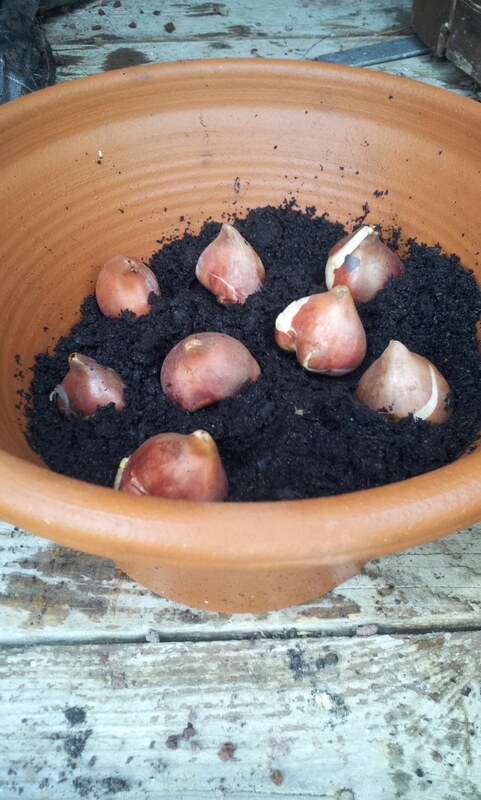 Whatever bulbs you decide to plant in your containers, they will all need good drainage. Compost that stays wet will cause the bulbs to rot. I use a mixture of three part John Innes No2 compost to one part horticultural grit. Don’t skimp on the grit. John Innes is a soil-based compost and is heavy to carry around. If you want to work with something lighter use a multi-purpose compost instead, but still add grit. There are specially prepared bulb composts on the market, sometimes called bulb fibre, which can be used in containers which have little drainage. Amaryllis (now called Hippeastrum) are huge bulbs that produce flamboyant flowers. The bulbs flower seven to ten weeks after potting, which means that those planted now will be cheering you up in February. They like to have their roots constrained so choose a container that is just slightly larger than the bulb. Before planting soak the dry, shrivelled roots in tepid water for a few hours − the easiest way to do this is to stand the bulb on a beer glass or old jam-jar. Plant the bulb with its neck protruding above the surface. The most widely available Hippeastum cultivars are those with red flowers, the deepest red being ‘Red Velvet’, but breeders have recently introduced a wide range of other colours. ‘Emerald’ has lots of flowers with narrow, pale green petals that are edged in pink. For a more exotic look consider growing ‘Papillio which has pale green petals that have deep red stains on their base. Grape hyacinths, Muscari, are enchanting from the moment the first tight buds emerge until weeks later when the translucent seed capsules appear. They look best when packed tightly together and even in a small 10cm pot you should be able to pack in seven to nine bulbs. The common dark blue Muscari armeniacum can spread rapidly once it is planted in the garden. Less vigorous are the beautiful aquamarine flowers that emerge from the green buds of M. armeniacum ‘Valerie Finnis’. 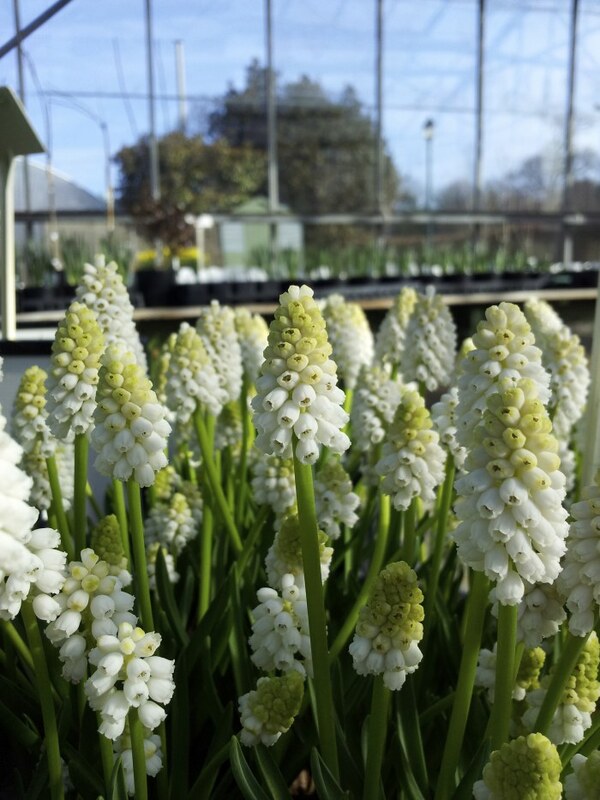 My favourite Muscari is a new variety,‘Peppermint’, which has cool white-with-a-hint-of-blue flowers. Ipheion bulbs should also be planted closely in the pot. The grassy foliage will form a lawn-like background to the starry flowers. The species has very pale blue-flowers, while on I. ‘Froyle Mill’ they are deep violet and have a honey scent. Miniature iris need space for the petals of their delicate flowers to unfurl so plant about 3-4cms apart. Growing them in pots means that you can easily appreciate the delicacy of their flowers. 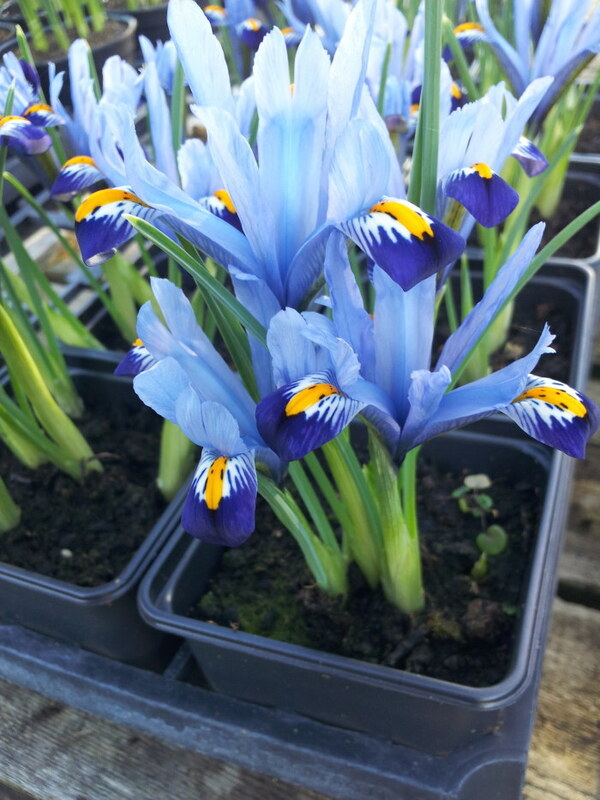 Iris ‘Katherine Hodgkin’ has large blue-grey petals that are intricately patterned. If you want a bolder colour grow Iris ‘George’, which has deep purple flowers that look as if they are made of velvet. Iris, Muscari and Ipheion bulbs need at least 9cm depth compost and all of them can be planted out in well-drained sunny spots in the garden after they have flowered. Of the tulips, the species are the most vigorous and long-lived. They tend to be shorter than the traditional hybrids and so are more suitable for growing in pots. A dozen T. sylvestris planted in a container 30cm wide will brighten a gloomy day with their golden flowers and sweet perfume. Just as dazzling are the scarlet flowers of Tulip linifolia. As the flower opens the petals lay flat like a water-lily to reveal a black centre. After they have finished flowering in their containers both of these should be planted in a sunny part of the garden where they will soon establish themselves and flower again every year. Veltheimia bracteata is a beautiful plant that will make a special gift for a green-fingered friend. A native of South Africa, it has glossy evergreen leaves and startling pink flowers that resemble those of a kniphofia. Plant the bulb just below the surface of the compost and it will soon produce foliage followed by flowers in the spring. It is not frost hardy so has to be kept indoors during the winter. The highly-scented flowers of paperwhite narccissi are a common sight at Christmas but if you plant them now you can also enjoy them over the next few months. Plant them tightly together in shallow containers about 10cm deep with their necks just above the surface of the compost. The foliage tends to flop, so stick a few hazel or birch twigs about 30cm tall into the pot to support the emerging growth. The strongest scent is said to be from the flowers of Narcissus ‘Ziva’.